Sites of interest include Head-Smashed-In, Bonfire Shelter, Ulm Pishkun, Madison Buffalo Jump, Dry Island, Glenrock, Big Goose Creek, Cibolo Creek, Vore,  Too Close for Comfort Site, Olsen-Chubbuck Bison Kill Site, and Camp Disappointment of the Lewis and Clark Expedition. Ulm Pishkun Buffalo Jump is likely the largest buffalo jump in the world. It was used by the Native Americans in the area between 900 and 1500 AD. The cliffs themselves stretch for more than a mile and the site below has compacted bison bones nearly 13 feet (4.0 m) deep. Ulm Pishkun Buffalo Jump is located in First Peoples Buffalo Jump State Park in Cascade County, Montana, north-northwest of the community of Ulm. ^ "About the Vore Buffalo Jump". 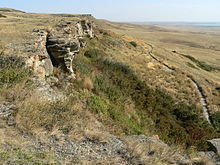 Vore Buffalo Jump. Vore Buffalo Jump Association. 2007. Archived from the original on 2010-05-11. Retrieved 2009-08-04. ^ "Madison Buffalo Jump State Monument". Geographic Names Information System. United States Geological Survey. June 1, 1995. Retrieved 2010-07-13. ^ a b "Madison Buffalo Jump State Park". Montana Fish, Wildlife and Parks. Archived from the original on 2010-07-10. Retrieved 2010-07-13. ^ "Camp Disappointment" (PDF). National Register of Historic Places. National Park Service. Retrieved 2015-05-17.